The highly anticipated TwitchCon took place at the Long Beach Convention Center this past weekend. This all-ages convention represents one of the biggest annual video gaming events worldwide, attracting tens of thousands of international attendees. As a convention that focuses on Twitch, a livestreaming website, many of the booths, vendors, and programs pertained to video games and streaming. As a major event, the convention contained so many activities, programs, booths, and more that one could not easily access everything in one day. From gaming tournaments to video game demos to streaming services and more, TwitchCon more than earns its place as one of the world’s top video game related events to attend. TwitchCon took over the entire Long Beach Convention Center, using up every single room and hall. TwitchCon dedicated some of the major rooms to its own programs, such as the Glitch Theater for screenings, or the H1Z1 Arena for H1Z1 tournaments throughout the weekend featuring some of the world’s top players of that game. On the other side of the convention center from the aforementioned rooms, attendees could find all the rooms for the seminars (all of which you can find recorded and uploaded on Twitch), as well as the Twitch Store, where attendees could purchase official Twitch apparel and accessories. Of course, who can forget about the expo hall? Nearly all of the action took place within the expo hall, which contained too many things going on that I could possibly list. A variety of stages, video game demos, exhibits, gaming vendors, and more covered the floor of the expo hall, spread out just enough to give attendees room to walk through. If an attendee wanted to check out every single booth and play every game demo available, that would definitely take more than one day at TwitchCon. But what about for those who did not care to play all the demos? TwitchCon sold 3-day passes in addition to single-day passes. Does one truly need more than one day at TwitchCon? Once you have seen all the booths, you have seen them – no need to return another day to see them again. Since the booths and stages remain the same, what changes daily? The programs change daily, and the people you may encounter change daily. As mentioned earlier, you can watch all of the programs that you may have missed – all of the seminars got recorded and uploaded to Twitch. As for the people, exactly what I predicted occurred – much like VidCon, the “celebrity” streamers constantly had a swarm of people following them. Nobody ever saw a “celebrity” streamer alone – they always had a posse with them. The majority of attendees only wanted to see these famous gamers and streamers, so the popular got more popular while many attendees did not care much about the lesser streamers. It felt like TwitchCon represented a platform for top streamers to show off their fame, rather than a convention to actually help small streamers grow their audiences. Oh, and the plague that has befallen Twitch known as “IRL”? What happens in IRL happened at TwitchCon too, especially with the female streamers. Put it this way – LOTS of female streamers present at TwitchCon essentially wore clothing that they would never wear to visit their grandparents, and like the famous streamers, one would never see them alone. Some people have already asked me, “How did you like TwitchCon?” To each person, I always gave a short and concise response: “I thoroughly enjoyed TwitchCon, but I would not go back again.” TwitchCon represents an event that you must attend at least once, but not need to attend multiple times. Any fan of video games and/or streamers ought to attend TwitchCon just to say that they did it and went. I compare TwitchCon to Coachella – I believe everyone should go to Coachella once just to say that they went. I will say the same thing about TwitchCon – I believe everyone should go to TwitchCon once just to say that they went. However, do not just jump the gun and flat out buy tickets to next year’s TwitchCon. If you have some favorite streamers that you follow, ask them if they plan to attend TwitchCon, and if they do intend to go, then by all means purchase a ticket so that you can meet them. If you do not visit Twitch already. I encourage you to create a Twitch account (if you do not already have an account) and start finding streamers to follow. Twitch has evolved beyond video gaming streams – Twitch now contains livestreams for almost any aspect of life, such as art, cooking, music, fitness, activities, events, travel, and more. If you have used Facebook Live, Twitter Live, Instagram Live, or Snapchat, then you already have the knowledge of livestreams. Check out my photos from TwitchCon 2017 below, and watch my videos from TwitchCon from each day: Day One, Day Two, and Day Three. Which came first: the chicken or the egg? Since the beginning of time, civilization has always asked what came first. While the public can typically attribute tangible items with an origin, everything else requires documentation to pinpoint an origin, unless generally accepted. For example, the gourmet food truck trend started in early 2009 with Kogi BBQ, which everyone will say started it all. When you look at expos for comic books, all fans will tell you that the San Diego one started it all. But with the San Diego Comic Con selling out in seconds every year, what else can fans do? Sure they can shell out the cash for super inflated after-market passes, but why not travel up the coast two hours to Los Angeles County? LA County hosts a handful of comics events and cons, some of which can appear as large as the San Diego one, such as Nerdbot-Con. Nerdbot-Con 2017 returned to the Pasadena Convention Center this past Saturday to a massive crowd easily in the thousands. For as large a turnout that appeared, this expo consumed the entirety of the conference center, the entire east building, to hold that many fans. Taking place in all rooms of the conference center, dozens of comic book writers and artists traveled here to exhibit their merchandise, art, books, toys, and more. In addition to the expo on the show floor, various workshops and seminars took place in the surrounding meeting rooms for those who registered ahead of time. Throughout the day, various activities took place on the show floor to keep attendees entertained, such as live bands, scene reenactments, karaoke, dancing, and more. Even to those not interested in comics, everyone should attend a comic expo/con just to see everyone dressing up in costume. 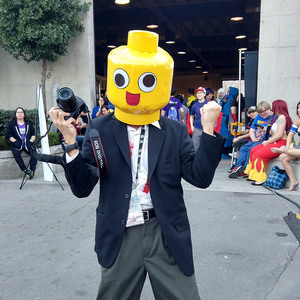 At any expo involving comics, video games, anime, manga, and more, any attendee cannot avoid seeing another guest participating in the inevitable cosplay for the duration of the event. Cosplay has turned into a staple for any sort of expo in this industry, and the fans proudly donned their best gear for this expo. Watch in amazement the best of the best of this year’s Nerdbot-Con. Missed out on Nerdbot-Con? Keep an eye out for other similar expos, such as Stan Lee’s Los Angeles Comic Con in late October, BlizzCon in early November, and Anime Los Angeles in late January. You have plenty of time to work up that unique and amazing DIY costume that everyone will want to take a picture of. The 2017 Long Beach Comic Con returned to the Long Beach Convention Center this past weekend to a massive crowd easily in the thousands. For as large a turnout that appeared, this expo consumed two of the convention center’s halls to hold that many fans. Taking place in both Halls B & C, hundreds of local comic book writers and artists traveled here to exhibit their merchandise, art, books, toys, and more. In addition to the expo on the show floor, various workshops and seminars took place in the nearby meeting rooms for those who registered ahead of time. Diehard fans will recognize the various celebrities sitting in for meet & greet and autograph sessions. For a large space, it took some time to walk through every single aisle to gaze at all the work on display. Earlier I had mentioned that this event occurs semiannually. Just like earlier this year, the comic con took place across two days, while the Spring event operates as the Long Beach Comic Expo. The next expo will take place in the middle of February next year back at the Long Beach Convention Center. Although existing under a different name, the same organizer runs both events, so you can expect largely the same things at the Spring expo. You can check out what else they have in store on their Facebook page and Twitter feed. Until then, keep an eye out for other similar expos, such as Stan Lee’s Los Angeles Comic Con in late October, BlizzCon in early November, and Anime Los Angeles in late January. You have plenty of time to work up that unique and amazing DIY costume that everyone will want to take a picture of. The 2017 Long Beach Comic Con returns to the Long Beach Convention Center this upcoming weekend. This two-day all-ages expo of comics, video games, anime, manga, and toys brings together fans, artists, designers, and more from around the world to meet with like minds and share interests. With plenty of speakers and workshops, the expo ensures that any attendee would find something to stay occupied. The Long Beach Comic Con has plenty more information to share on their website, as well as all their social media, such as their Facebook and Twitter pages. For those posting about the event, use the hashtags #LBCC #LBCC17 or #LBCC2017 since all three will refer to the event. The convention runs on both Saturday and Sunday this weekend: starting at 10am to 7pm on Saturday, and 10:30am to 5pm on Sunday. Purchase your admission by 5pm this Friday to gain access to the convention half an hour earlier. Presale admission costs $40 to attend on Saturday, $35 to attend on Sunday, or $60 for the entire weekend. Admission passes at the door will cost $5 extra. Parking at the convention center costs $10 per vehicle. Those looking for free parking will not find much in Downtown Long Beach, so either park in the neighborhood east of Alamitos Ave, or take public transportation from elsewhere. This expo takes place mainly indoors, so most visitors will not have to worry about sunlight or excess heat; however, anyone intending to remain outside for prolonged periods for photographs should apply sunscreen just in case.